Remove luggage side lower finisher (LH). Refer to INT-33, "Exploded View". Disconnect AWD control unit harness connector. 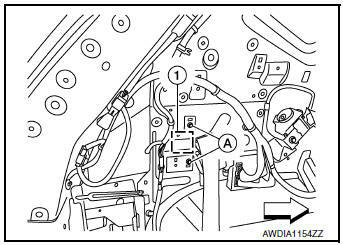 Remove AWD control unit bolts ( ). NOTE: AWD control unit is located on the back side of body panel. Do not drop or shock AWD control unit. When replacing AWD control unit, perform writing unit characteristic. Refer to DLN-35, "Work Procedure". Remove instrument lower panel LH. Refer to IP-22, "Removal and Installation". 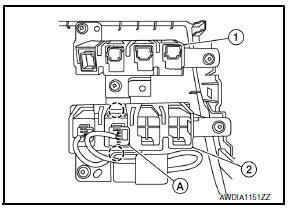 Disconnect AWD lock switch harness connector (A). Remove AWD lock switch from lower switch bracket (2). Replacement on vehicle may cause damage to transfer cover, and may cause a transfer oil leak. If transfer cover oil seal requires replacement, remove the transfer assembly from the vehicle before replacing transfer cover oil seal. Refer to DLN-73, "Disassembly".